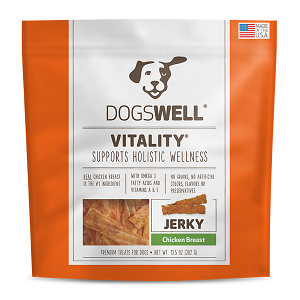 All Dogswell products are made from premium, natural ingredients with one catch - unlike most food available for pets, Dogswell products come in a variety of functional formulas that are healthy for your dog. Vitality is like a spa treatment for your pet with flaxseed and Vitamins A and E for healthy eyes, skin, coat, and overall health. Flaxseed is rich in Omega 3 and 6 fatty acids to help promote a shiny coat. Flax is a good source of magnesium, phosphorous and copper, and a very good source of dietary fiber, thiamin and manganese. It also contains vitamins including B group and E. Vitamin E is an antioxidant rich essential fat soluble vitamin. Vitamin E keeps the connective tissues strong and prevents skin and muscles from losing elasticity.